As the real estate market appears to be rebounding it has given birth to an entire new industry—staging. And you know an industry has arrived when it makes its debut into fiction. 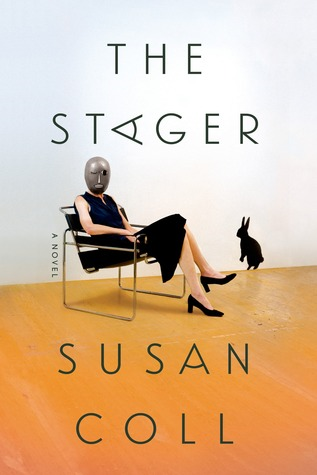 Susan Coll’s new novel The Stager is about a quirky stager, who remains nameless for much of the novel (which is not surprising as these people slip into your home, remove everything that is yours and replace it with anonymous furnishings) but becomes an integral part of the main family’s life. They need to sell their house fast as the wife has been promoted into a new high level position in London and they’ve already purchased a house there. Unfortunately, a psychotic rabbit, a recalcitrant child, and a high maintenance husband are making the move especially difficult. Bella is the uber achieving, Hermes-bag-owning executive in this drama and yet, despite being the only character with any control she is the only one with no voice. We hear the story extensively from her husband Lars and her daughter Elsa and then later from the stager Eve, but Bella, the centerpiece of all this narrative never speaks on her own behalf. She apparently controls all and either feels no need to give her side of the story or is prevented from doing so. Either way, it makes the retelling of this group’s history wildly inventive and amusing. Elsa is everyone’s worst nightmare of an only child—precocious and so solidly certain of her inalienable right to anything and everything she wants that there are no limits to what she will do to get it. Can’t find the Pop Tarts in the kitchen newly cleaned by the stager? Pull everything out of every cupboard, then change your mind, and leave. Want your bedroom to have a huge rabbit painted on the wall despite the stager saying it was not a good idea? Get the paint yourself, spill it, then walk in it and on your white carpet, and again, leave. She is also the proud owner of Dominique, the rabbit, who is apparently demented and wants to return to the wild so he runs away at every opportunity but not before chewing holes in the carpet, throwing up, climbing the drapes, and slashing holes in velvet upholstery with his claws. Eve is the hapless stager and initially remains as innocuous as the furnishings she tries to set up in the Jorgenson house and deal with a pre-middle school child who thinks the world revolves around her. What slowly becomes apparent is that Eve is not unknown to the Jorgensons—most specifically to Bella. In fact, they go back many years to when they were both financial journalists and good friends. And then they were not and now Eve wants to set the record straight; all while maintaining her professional ethics and doing her best to ready their house for sale. The Stager is sly and snarky and Coll ties the story together like a good room, adding pieces here and there to fill in the gaps between the characters. It is no coincidence that Eve takes this job but her rationale for doing so is a bit off. Regardless, it all leads to a funny conclusion in this satire about real estate, friendship, money and life and if Coll leaves some portions of the novel askew, in a way a stager would find off-putting, they are not enough to ruin the overall appeal of the story. As a buyer I’m sold.